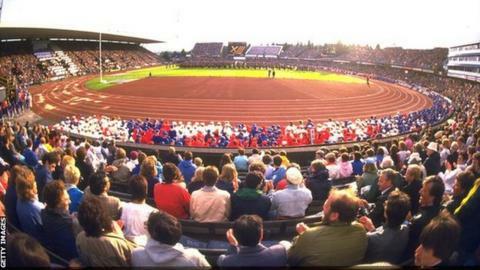 The 1986 Commonwealth Games in Edinburgh are sadly remembered for the wrong reasons. While there was Scottish 10,000m gold for Liz Lynch, now Liz McColgan, the Games came at a heavy financial cost due to the boycott by 32 out of the 59 competing nations. Teams withdrew after being angered by the British government's attitude to apartheid-era South Africa. One of the nations that pulled out was Bermuda. As Scotland prepares to host the Games once more, memories of the Edinburgh Games were brought back this week when the Queen's Baton Relay - the main curtain raiser for the Games - passed through the North Atlantic island. For Bermudian swimmer Victor Ruberry and 100m runner Bill Trott, 1986 was a farce. It is an episode of their lives which still causes frustration. Before the Games, Ruberry and Trott were gravely concerned like thousands of others about apartheid in South Africa. They remember discussions on the island about boycotting, but no decision was made and the athletes made their way to Scotland. They just wanted to compete. However, the Bermuda Olympic Association (BOA) - the governing body of the team - was still considering what to do. When the athletes arrived in Edinburgh, there were reports of safety concerns for the Bermudians. According to team manager John Morbey, this was one of the reasons given behind the team's eventual withdrawal. "The night before the opening ceremony, a teammate and I caught a taxi and we went to a disco," recalls Trott, who was looking forward to his first Commonwealth Games having competed in the 1984 Olympics. "There was no-one supervising us, and that is how safe we felt. As we came back late at night, we bumped into John Morbey and he had just found out that the Bermuda Olympic Association had pulled us out. "That is when all the drama started. I was deflated." Trott and Ruberry woke up on 24 July, the day of the opening ceremony, with no idea what was going on. After a day of discussions, Trott remembers a call was eventually made to Bermuda's leader John Swan while the opening ceremony was taking place on television screens behind them. Swan offered his support, and Trott and his teammates frantically got dressed into their Panama hats, blue blazers and beige shorts and rushed to Meadowbank Stadium to take part. Having missed their slot, they marched on just before the host nation and received one of the biggest cheers of the night, with Scottish fans - facing a Commonwealth Games without half the Commonwealth - showing their delight. Ruberry, meanwhile, missed the ceremony as he prepared to take part in his 100m breaststroke the following day. He remembers Morbey coming into his room around midnight to confirm he would be swimming in the morning. By the time he had reached the pool, Ruberry knew it was all in vain. The BOA had finally decided to remove the team from the Games. Ruberry was disqualified for keeping his head under water at the end of his race. He said: "Your mental state was not one where you were focused on competition. "It was an abysmal swim. It was nowhere near what I was prepped to do prior to that. I am not making excuses, I just did not feel ready. At one point we were packing our bags, the next moment we were unpacking our bags." After the team's withdrawal, Morbey went on television in disgust over the BOA's decision while the athletes hung their bed sheets out the window with 'Bermuda wants to stay, don't penalise our athletes' written on one. When the Bermudians returned home, Trott remembered an island sympathetic towards the athletes but behind the decision to boycott. Twenty-eight years later, the athletes still reflect on what the 1986 boycott meant for them. Trott said: "It was unfortunate that we were put in a situation like that. What I learnt from all of that was politics can play a role in some cases that it shouldn't." For Ruberry, the Edinburgh Games were the second time his dreams had been shattered by a political boycott after missing out on the 1980 Moscow Olympics. He gave up swimming, believing the countless hours of training were not worth it when it could all be scuppered by a boycott. He returned to the pool for the 1988 Olympics, and now works as a swimming coach on the island. He said: "Any sporting event brings people together. Boycotts serve to divide. "They are a huge disappointment for the athletes who have been training so hard for something like that, and all of a sudden you take away the goalposts. "I still to this day don't believe there is a place for boycotts in sport. There is so much more that can be accomplished by the positives - the healthy competition, people coming together. "If you are going to do something political, then don't use the athletes as pawns." Trains with Bolt, faster than Blake - GB's next sprint star?